This article is about the media company. For the founder, see Condé Montrose Nast. For other uses, see Condé Nast (disambiguation). The company attracts more than 164 million consumers across its 19 brands and media: Allure, Architectural Digest, Ars Technica, Backchannel, Bon Appétit, Brides, Condé Nast Traveler, Epicurious, Glamour, Golf Digest, GQ, Pitchfork, Self, Teen Vogue, The New Yorker, Vanity Fair, Vogue, W and Wired. Condé Montrose Nast, a New York City-born publisher, launched his magazine empire in 1909 with the purchase of Vogue, which was first created in 1892 as a New York weekly journal of society and fashion news. At first, Nast published the magazine under Vogue Company and did not incorporate Condé Nast until 1923. He had a flair for nurturing elite readers as well as advertisers and upgraded Vogue, sending the magazine on its path of becoming a top fashion authority. Eventually, Nast's portfolio expanded to include House & Garden, Vanity Fair (briefly known as Dress and Vanity Fair), Glamour and American Golfer. The company also introduced British Vogue in 1916, and Condé Nast became the first publisher of an overseas edition of an existing magazine. Condé Nast is largely considered to be the originator of the "class publication," a type of magazine focused on a particular social group or interest instead of targeting the largest possible readership. Its magazines focus on a wide range of subjects, including travel, food, home, culture, and other interests, with fashion the larger portion of the company's focus. Nast opened a printing press in 1924, which closed in 1964 to make way for more centrally located sites capable of producing higher volumes. During the Great Depression, Condé Nast introduced innovative typography, design and color. Vogue's first full color photograph was featured on the cover in 1932, marking the year when Condé Nast began replacing fashion drawings on covers with photo illustrations―an innovative move at the time. Glamour, launched in 1939, was the last magazine personally introduced to the company by Nast, who died in 1942. In 1959, Samuel I. Newhouse bought Condé Nast for US$5 million as an anniversary gift for his wife Mitzi, who loved Vogue. He merged it with the privately held holding company Advance Publications. His son, S.I. Newhouse, Jr., known as "Si," became chairman of Condé Nast in 1975. The Newhouse era at Condé Nast launched a period of acquisitions (Brides was acquired in 1959), overhauls of existing magazines (after being shuttered in 1936, Vanity Fair was revived in 1983) and the founding of new publications (Self was launched in 1979). In January 2000, Condé Nast moved from 350 Madison Avenue to 4 Times Square, which at the time was the first skyscraper built in New York City since 1992 and boasted a Frank Gehry cafeteria. The move was also viewed as contributing to the transformation of Times Square. In the same year, Condé Nast purchased Fairchild Publications (now known as Fairchild Fashion Media), home to W and WWD, from the Walt Disney Company. In 2001, Condé Nast bought Golf Digest and Golf World from The New York Times Company for US$435 million. On October 5, 2009, Condé Nast announced the closure of three of its publications: Cookie, Modern Bride, and Elegant Bride. Gourmet ceased monthly publication with its November 2009 issue; the Gourmet brand was later resurrected as "Gourmet Live," an iPad app that delivers new editorial content in the form of recipes, interviews, stories and videos. In print, Gourmet continues in the form of special editions on newsstands and cookbooks. Other Condé Nast titles were shut down as well. The company folded the women's magazine Jane with its August issue in 2007 and later shut down its website. One of Condé Nast's oldest titles, the American edition of House and Garden, ceased publication after the December 2007 issue. Portfolio, Mademoiselle and Domino were folded as well. Condé Nast has also made some notable acquisitions. On October 31, 2006, Condé Nast acquired the content aggregation site Reddit, which was later spun off as a wholly owned subsidiary in September 2011. On May 20, 2008, the company announced its acquisition of a popular technology-oriented website, Ars Technica. In July 2010, Robert Sauerberg became Condé Nast's president. In May 2011, Condé Nast was the first major publisher to deliver subscriptions for the iPad, starting with The New Yorker; the company has since rolled out iPad subscriptions for nine of its titles. In the same month, Next Issue Media, a joint venture formed by five U.S. publishers including Condé Nast, announced subscriptions for Android devices, initially available for the Samsung Galaxy Tab. In June 2011, Condé Nast announced that it would relocate its headquarters to One World Trade Center in 2015. In September 2011, Condé Nast said it would offer 17 of its brands to the Kindle Fire. The company launched Conde Nast Entertainment in 2011 to develop film, television and digital video programming. In May 2013, CNÉ's Digital Video Network debuted, featuring web series for such publications as Glamour and GQ. Wired joined the Digital Video Network with the announcement of five original web series including the National Security Agency satire Codefellas and the animated advice series Mister Know-It-All. In late October 2013, the company ceased its low and unpaid internship program. In November 2014, Condé Nast moved into One World Trade Center, where its new headquarters is located. On September 14, 2015, the company announced Robert A. Sauerberg Jr. was appointed as its chief executive officer (CEO) and will remain its president; its former CEO, Charles H. Townsend, would be its chairman, while S.I. Newhouse Jr. would be chairman emeritus (effective January 2016). On October 13, 2015, Condé Nast announced that it had acquired Pitchfork. In July 2016, Conde Nast announced the launch of Condé Nast Spire, a new division that will focus on finding links between consumers' purchasing activity and their content consumption by connecting Condé's own first-party behavioral data. Chairman Charles Townsend retired at the end of 2016 and chairman emeritus S.I Newhouse died the following October 1. In March 2018, Condé Nast announced the launch of Influencer Platform Next Gen. "The Platform features both in-house and external talent with significant and meaningful social followings,” said Pamela Drucker Mann, chief revenue and marketing officer for Condé Nast. ^ Citicorp-Signature Magazine was acquired from Citigroup. ^ Harris Publications-Woman was acquired from Harris Publications. ^ Pennington Publishing-Cook's was acquired from Bonnier AB. ^ K-III Magazines-Magazine Sub was acquired from Primedia. ^ Wired Magazine was acquired from Telefonica. ^ Fairchild Publications was acquired from The Walt Disney Company. ^ Johansens, the parent company of Daily Mail, was acquired from Rothermere Investments. ^ Modern Bride Group was acquired from Primedia. ^ Ideas Publishing Group was acquired from Advance Publications. ^ Lycos Inc-Wired News was acquired from Telefonica. ^ Conde Nast Publications acquired a 40% interest in Wagadon. ^ Conde Nast Publications acquired a majority interest in Ideas Publishing Group. ^ "Condé Nast | Crunchbase". Crunchbase. Archived from the original on 2018-03-03. Retrieved 2018-03-02. ^ A Brief History of the Condé Nast Publications, New York: CNP, 1993. ^ "Today in History: March 26". Library of Congress. November 9, 2010. Archived from the original on 2012-09-25. Retrieved November 2, 2011. ^ "IN VOGUE: The Illustrated History of the World's Most Famous Fashion Magazine". NYTimes.com. December 3, 2006. Archived from the original on 2012-09-25. Retrieved November 3, 2011. ^ Sumner, David E. (2010). The Magazine Century: American Magazines Since 1900. Peter Lang. ISBN 9781433104930. Archived from the original on 2018-03-03. Retrieved 2018-03-02. ^ Mahon, Gigi (1989-09-10). "S.I. Newhouse and Conde Nast; Taking Off The White Gloves". Archived from the original on 2017-10-26. Retrieved 2017-08-26. ^ Bagli, Charles. "Conde Nast's Stylish Clan Moves Into Times Sq". The New York Times. June 6, 1999. Archived from the original on 2012-09-25. Retrieved November 3, 2011. ^ Agovino, Theresa. 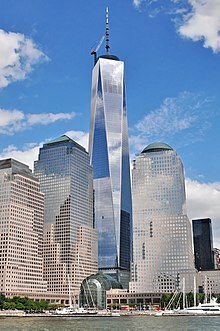 "Condé Nast deal at 1 WTC now official". Crain's New York. June 6, 1999. Archived from the original on 2012-09-25. Retrieved November 3, 2011. ^ Kuczynski, Alex. "Merger Planned for 2 Giants of Fashion Publishing". The New York Times. August 20, 1999. Archived from the original on 2012-09-25. Retrieved November 3, 2011. ^ Arrington, Michael. "Breaking News: Condé Nast/Wired Acquires Reddit". TechCrunch. Archived from the original on 2018-02-15. Retrieved 2018-03-02. ^ Kaplan, David. "Next Issue Media Works To Build The Storefront Before The Audience Arrives". PaidContent. June 29, 2011. Archived from the original on 2012-09-25. Retrieved November 3, 2011. ^ Bagli, Charles. "Condé Nast Will Be Anchor of One World Trade Center". The New York Times. May 17, 2011. Archived from the original on 2012-09-25. Retrieved November 3, 2011. ^ Vranica, Suzanne. "Magazines Join With New Tablet Challenger". The Wall Street Journal. September 29, 2011. Archived from the original on 2015-03-17. Retrieved November 3, 2011. ^ Tatiana Siegel (May 12, 2013). "Conde Nast Launches Digital Video Network - The Hollywood Reporter". The Hollywood Reporter. Archived from the original on 2013-05-20. Retrieved June 23, 2013. ^ Erik Hayden (May 15, 2013). "Conde Nast Entertainment Launches 'Wired' Video Channel". The Hollywood Reporter. Archived from the original on 2013-06-24. Retrieved June 23, 2013. ^ Erik Maza (May 2, 2013). "Condé Entertainment Previews Video Channels for Vogue, Wired and Vanity Fair". Women's Wear Daily. Archived from the original on 2013-06-24. Retrieved June 23, 2013. ^ Buckley, Cara. "Sued Over Pay, Condé Nast Ends Internship Program". New York Times\date=Oct. 23, 2013. Archived from the original on 2017-05-06. Retrieved 2017-02-15. ^ "Why Condé Nast Felt It Had To Stop Using Interns". Forbes. October 24, 2013. Archived from the original on 2017-07-22. Retrieved 2017-08-26. ^ "Condé Nast Colonizes Lower Manhattan". The New York Times. 2015-09-30. ISSN 0362-4331. Archived from the original on 2018-03-03. Retrieved 2018-03-02. ^ Somaiya, Ravi (September 14, 2015). "Condé Nast Names Robert Sauerberg New C.E.O." The New York Times. Archived from the original on 2015-09-17. Retrieved September 14, 2015. ^ a b "Condé Nast Buys Pitchfork Media". The New York Times. Archived from the original on 2017-07-09. Retrieved 13 October 2015. ^ Emma Bazilian (26 July 2016). "Condé Nast Is Connecting Media Consumption and Purchase Data to Improve Branded Content". Adweek. Archived from the original on 2016-07-27. Retrieved 28 July 2016. ^ "Condé Nast Influencer Platform: 'Journalism' for Cash?". Ikon London Magazine. 2 March 2018. Retrieved 3 March 2018. ^ "The world of Hibernia" Archived 2012-04-07 at the Wayback Machine. National Library of Ireland Catalog. ^ "Bad tidings; it is the end of the World of Hibernia - Independent.ie". ^ "Conde Nast Publications Inc acquires Citicorp-Signature Magazine from Citigroup Inc (1987/12/30)". Thomson Financial. Archived from the original on July 21, 2012. Retrieved October 28, 2008. ^ "Conde Nast Publications Inc acquires Harris Publications-Woman from Harris Publications Inc (1988/11/30)". Thomson Financial. Archived from the original on July 18, 2012. Retrieved October 28, 2008. ^ "Conde Nast Publications Inc acquires Pennington Publishing-Cook's from Bonnier AB (1990/06/25)". Thomson Financial. Archived from the original on July 20, 2012. Retrieved October 28, 2008. ^ "Conde Nast Publications Inc acquires K-III Magazines-Magazine Sub from Primedia Inc (1992/04/22)". Thomson Financial. Archived from the original on July 20, 2012. Retrieved October 28, 2008. ^ "Conde Nast Publications Inc acquires Knapp Communications Corp (1993/04/20)". Thomson Financial. Archived from the original on July 22, 2012. Retrieved October 28, 2008. ^ "Conde Nast Publications Inc acquires Wired Magazine(Wired Ventures) from Telefonica SA (1998/06/12)". Thomson Financial. Archived from the original on July 17, 2012. Retrieved October 28, 2008. ^ "Conde Nast Publications Inc acquires Fairchild Publications Inc from Walt Disney Co (1999/12/01)". Thomson Financial. Archived from the original on July 16, 2012. Retrieved October 28, 2008. ^ "Conde Nast Publications Inc acquires Johansens Ltd(Daily Mail) from Rothermere Investments Ltd (2001/09/05)". Thomson Financial. Archived from the original on July 16, 2012. Retrieved October 28, 2008. ^ "Conde Nast Publications Inc acquires Modern Bride Group(Primedia) from Primedia Inc (2002/02/28)". Thomson Financial. Archived from the original on July 16, 2012. Retrieved October 28, 2008. ^ "Conde Nast Publications Inc acquires remaining interest in Ideas Publishing Group from Advance Publications Inc (2002/03/28)". Thomson Financial. Archived from the original on July 30, 2012. Retrieved October 28, 2008. ^ "Conde Nast Publications Inc acquires LYCOS Inc-Wired News from Telefonica SA (2006/07/11)". Thomson Financial. Archived from the original on July 17, 2012. Retrieved October 28, 2008. ^ "Conde Nast Publications Inc acquires NutritionData.com (2006/07/20)". Thomson Financial. Archived from the original on August 28, 2010. Retrieved October 28, 2008. ^ "Breaking News: Condé Nast/Wired Acquires Reddit (2006/10/31)". TechCrunch. Archived from the original on 2006-11-17. Retrieved October 31, 2006. ^ "Conde Nast Publications Inc acquires SFO*Media LLC (2008/05/20)". Reuters. April 24, 2008. Archived from the original on September 10, 2012. Retrieved November 14, 2008. ^ "Conde Nast Publications Inc acquires Ars Technica LLC (2008/05/20)". Thomson Financial. Archived from the original on May 2, 2009. Retrieved October 28, 2008. ^ "The Conde Nast Startup Story Yahoo Should Study For Tumblr (2013/05/23)". Forbes. Archived from the original on 2013-06-07. Retrieved April 11, 2012. ^ "Conde Nast Publications Inc acquires a minority stake in Wired Magazine(Wired Ventures) from Telefonica SA (1994/01/19)". Thomson Financial. Archived from the original on October 18, 2010. Retrieved October 28, 2008. ^ "Conde Nast Publications Inc acquires Ideas Publishing Group (2001/01/17)". Thomson Financial. Archived from the original on July 29, 2012. Retrieved October 28, 2008.